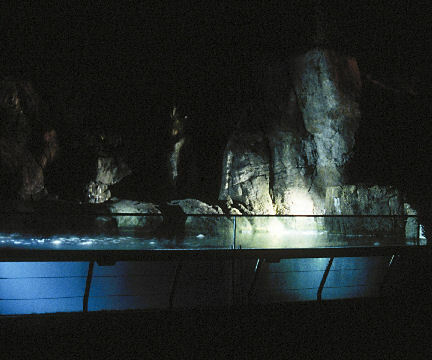 In tests against sodium vapor and incandescent sources, metal-halide lighting proved to have the best color rendering through the water, though different sources were used: Manufacturers include North Star (400W metal-halide mercury vapor Marine Star Floods and metal-halide Challenger Floodlights), Phoenix (AMS series all-weather architectural PAR-38s), Quality Lighting (concentric beam floodlights and die-cast aluminum decorative pendants on trees at the rear of the property), and Stonco (vapor-tight wall incandescents and pencil-beam flagpole long-throws). Light sconce metal fabrication was executed by Derecktors Shipyard in Mamaroneck, with PVC-coated rigid metal conduit provided by Perma-Cote Industries, and custom brackets by Precision Metal Fabricators. Dimming is by Lutron. This entry was posted on September 27, 2011 at 10:25 pm and is filed under Design. You can follow any responses to this entry through the RSS 2.0 feed. You can leave a response, or trackback from your own site.